With an overhand grip (i.e. palms facing forward), grasp a pull-up bar and hang from it. Note: If you have difficulty holding onto the bar you may use lifting straps. In a slow and controller manner, move your legs upward from side to side; that is, move them upward to one side, return to the center, and then move them upward to the other side (i.e. right, left, right, left, etc.). Remember that your aim is to target the serratus muscles. Repeat step 2 for as many repetitions as are desired. 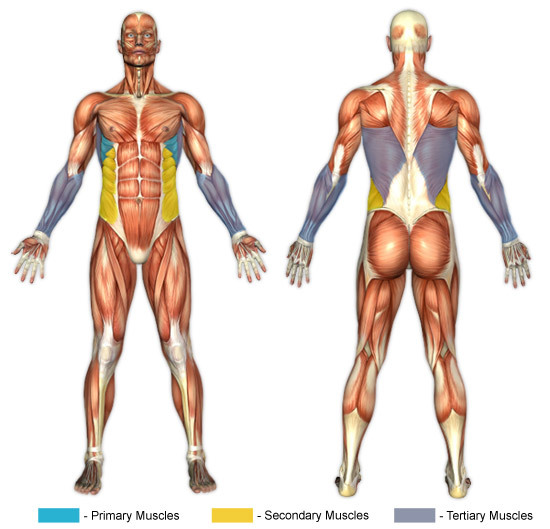 Controlled technique is imperative for isolation of the serratus muscles to be achieved; swinging your legs from side to side will not accomplish this. Instead, focus on feeling the stretch of your serratus on the opposite side of your body than the side which you have raised your legs to, all the while maintaining deliberate, controlled movements.